We act for both buyers and sellers of new and used homes throughout Central Alberta. For most first-time homebuyers, the purchase of their first home is an exciting time. However, many homebuyers are surprised by the amount of legal “red tape” and new information they’re faced with in considering their purchase. For many, the most significant financial transaction up to this time may have been the purchase of a vehicle. In such a situation, it is a relatively straightforward and simple exchange of money for property. As you may already know, buying a home is a bit more complicated, but it’s our view that the lawyer’s job is to make your home purchase just as simple. Because this is probably one of the most significant financial events of your life, it is important that you are well informed about the whole transaction. As a lawyer, our job is not only to protect our client’s legal and financial interests, but we are also an integral player in the transaction whose job is also to answer any questions the client may have, work together with your Realtor and your bank or Mortgage Broker and help the client make sense of all the new information they are faced with. Sully Chapman Beattie LLP represents a number of major home builders, developers and contractors who do business in Red Deer and the Central Alberta Region. In our capacity as their legal representative, we assist those clients with a wide range of issues pertaining to their businesses of contracting, development and sales: Transactions relating to land procurement and development; working with relevant municipal governments associated with development applications and permits; dealing with issues arising under Alberta’s Builder’s Lien Act, and all other related legal services as needed. We are often called on to act on behalf of lending institutions as well as our clients for the purposes of preparing and registering the security documentation in connection with a variety of credit facilities to assist in their business needs. Often this includes secured financing with attendant registrations with Land titles and Alberta’s Personal Property Registry, all due diligence related to confirming corporate validity and all supporting documentation necessary. Drafting letters of intent regarding the purchase or sell of shares or assets of a business. Our firm acts for approximately 400 corporations in the capacity as their legal counsel. The size of these corporate clients are many and varied: from sole or small shareholder �Mom & Pop� type operations, to large multifaceted complex Corporate structures involving amalgamated companies, holding companies, operating companies, family trusts and all combinations in between. Not only are we the Registered Office for our client company, we also attend to preparing all of the documentation necessary to filing an Annual Return to Alberta�s corporate Registry in order to maintain our clients continued valid status as a company. We also have a significant number of corporate clients who require themselves to be registered extra-provincially, in neighbouring provinces, or alternatively, are an out-of-province company that needs to be registered here in Alberta in order to conduct business. We have the necessary experience with attending to these unique needs as well as the necessary professional connections to make the process of extra provincial incorporation simple and straight-forward. We are also experienced with incorporating companies at the federal level. At Sully Chapman Beattie LLP, we have experience with the preparation and negotiation of all types and forms of commercial Leases – whether the client is the landlord or tenant. We will assist in advising our client of all of the pertinent terms and conditions fundamental to the lease, as well as tailor a landlord’s lease to the specific use intended or for the particulars necessary of the property itself. Kent and Kevin both have past experience is assisting clients with interpreting and negotiating franchise agreements – primarily on behalf of the client as franchisee / business owner. Having a properly constituted and valid legal will is the cornerstone of your Estate Planning. Many people spent the time and money to ensure that their life insurance is sufficient, their finances are arranged to provide for retirement and subsequent beneficiaries, but then they often forget to do a proper will. Without a valid will, an individuals property would be gifted in accordance with Alberta’s Intestate Succession Act. Contrary to popular misunderstanding however, the government does not get your property if you have no will – rather if you die intestate (without a will) this legislation provides the default rules for who will benefit from your estate. If you have minor children, special provisions must be made through the contents of your Will to ensure that they and their entitlements are looked after by a Guardian and Trustee of your choosing and appointment. Without a valid Will appointing Guardians and Trustees for minor children, it is ultimately up to the Court to decide who best to look after the child(ren) and their Trust benefits. There are many traps and pitfalls associated with using off-the-rack “legal will kits”, as well as opting to do your own holographic (handwritten) will: particularly if you have anything but simple gifting provisions. 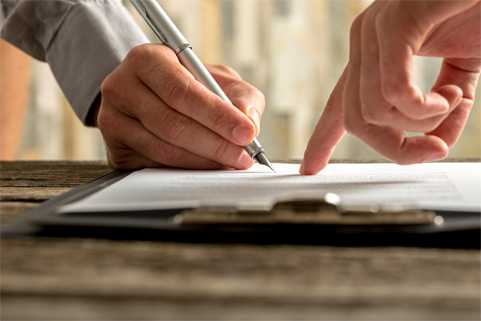 A properly drafted will, prepared by one of our lawyers is the best way to ensure the passing of your estate occurs exactly as you intend. As part of your Estate plan, we will discuss the necessities of both an Enduring Power of Attorney and a Personal Health Directive. These documents are crucial to determining who will look after your personal and financial affairs in the event you suffer a medical event or injury that leaves you incapacitated. We have experience with preparing the documentation necessary to the creation of these types of legal entities – which in many cases can be quite complex. Our firm works in consultation with the Client’s accountant or professional adviser in creating these structures with the intent of maximizing tax savings as provided for and allowed by Canada’s Income Tax Act. If you find that you have been appointed the Executor or Personal Representative to someone’s estate – your first thought is that this is a huge and daunting task! To be sure, the administration of an estate creates specific legal duties upon the Executor – as well as an often significant administrative burden connected with the inventory and collection of the deceased’s assets and liabilities, the sale and transfer of same where necessary, and most importantly, the preparation of any and all documentation necessary in an application to the Court of Queen’s Bench for a Grant of Probate and Administration, or any other Court applications that may be necessary in the circumstances in order for the Executor to fulfill their duties. We have the sufficient expertise and experience to assist the Executor with all facets of administrating an Estate to completion. We have numerous working relationships with many other professional advisers in Central Alberta, such as realtors, accountants, financial planners, insurers, business and land appraisers and other legal counsel. In the course of our representation, we sometimes find our clients require professional expertise in other matters specifically unrelated to our own. We therefore ensure that, where necessary, we are able to refer and connect our clients with the best possible professionals available to suit their unique needs.